Florida’s JTA Chairman Kevin Holzendorf and CEO Nathaniel P. Ford Sr., along with Mayor Lenny Curry and city leaders, joined with Secretary Elaine L. Chao in formally announcing the awarding of the US DOT’s $25 million BUILD Grant. The U.S. Department of Transportation issued a $25 million BUILD Grant to the Jacksonville Transportation Authority (JTA) and the City of Jacksonville. 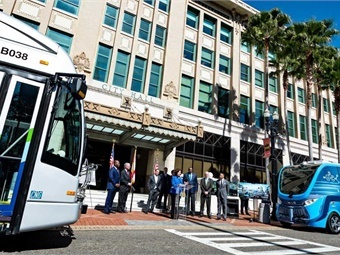 JTA will use its $12.5 million portion of the grant to implement the first phase of the Ultimate Urban Circulator or U2C program, called the Bay Street Innovation Corridor. The project will deploy a transportation network of autonomous vehicles and incorporate smart technologies, such as pedestrian sensors, dynamic traffic signaling, and an integrated data exchange; from the Jacksonville Regional Transportation Center at LaVilla to the City’s Entertainment District along the Bay Street Corridor. JTA is partnering with the Florida Department of Transportation, the City of Jacksonville, North Florida TPO, the JEA, and the Jacksonville Regional Chamber of Commerce on the Innovation Corridor project. For its part, the city will undertake the Urban Core Riverfront Revitalization and Complete Streets project to bolster Jacksonville’s commitment to downtown development in and around the Jacksonville Sports and Entertainment Complex and shipyards.